ROCKINGHAM — Seven-year-old Anthony Wright wants to be a basketball star. Stevonnie Crouch, 7, wants to be a “police girl,” and Kayla Lewis, 8, wants to be a race car driver. Perry Williams told them all: Make it happen. “It’s your time to shine,” Williams said. Hazel Robinson shows Perry Williams, right, and Phillip Owens a photo Williams signed for her 12-year-old son 21 years ago. 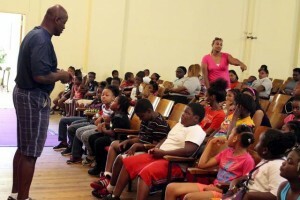 Williams, a 54-year-old Hamlet native and former NFL cornerback who won two Super Bowl rings in a 10-year career with the New York Giants, spoke to and with nearly 70 boys and girls Thursday as a featured speaker of the Summer Fun and Food Program at Leak Street Educational and Cultural Center. He related to them in a way that many of the kids probably wouldn’t think a professional athlete could. First, Williams noted, he was raised right down the road in Hamlet. Second, he came from a broken home — his parents divorced when he was 3 years old. But don’t let such a personal history, Williams cautioned, prevent anyone from achieving their goals. 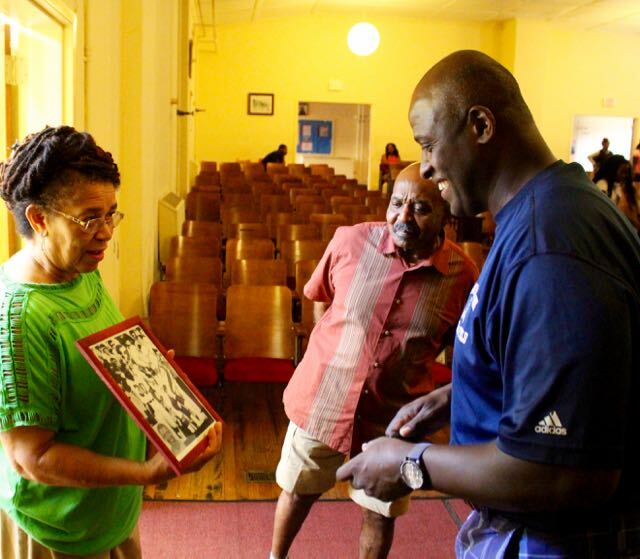 Williams said he was raised by his mother, Hattie Williams, and his grandmother. The two helped keep Perry Williams on the right track. He said at the age of 10, he told his mother that the wanted to be a professional football player and compete in the Super Bowl, arguably the world’s largest professional stage this side of soccer. “I was gonna be somebody,” Williams said. With a table showing his two Super Bowl rings while playing for the New York Giants, Perry Williams signs autographs for kids at Leak Street’s summer camp. But his family helped keep those dreams in check; Williams said the only bowl he’d be in charge of is the toilet bowl. The night before the 1987 Super Bowl when the Giants were preparing to take on the Denver Broncos in Pasadena, Calif., Williams said he called home. Williams stressed the importance of obtaining the education — he opened with that lesson and closed with it, too. 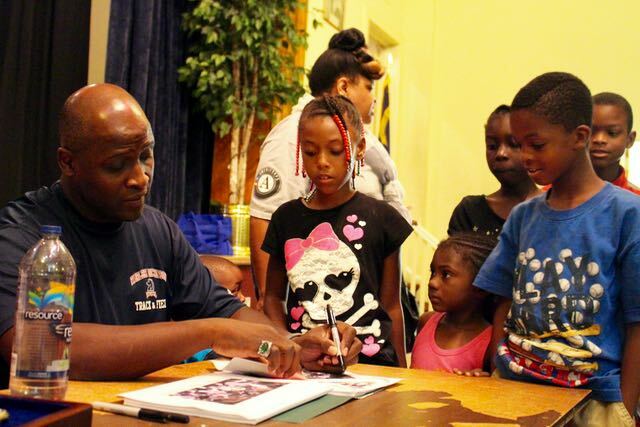 While helping the Richmond Senior High School Raiders to a state football title in 1978, Williams earned a football and track scholarship to N.C. State University, where he was a two-time All-American before being drafted in the seventh round of the 1983 NFL draft. 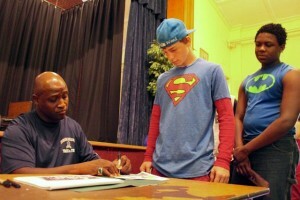 While in the NFL, a friend and mentor of Williams’ talked to him about the importance of education. 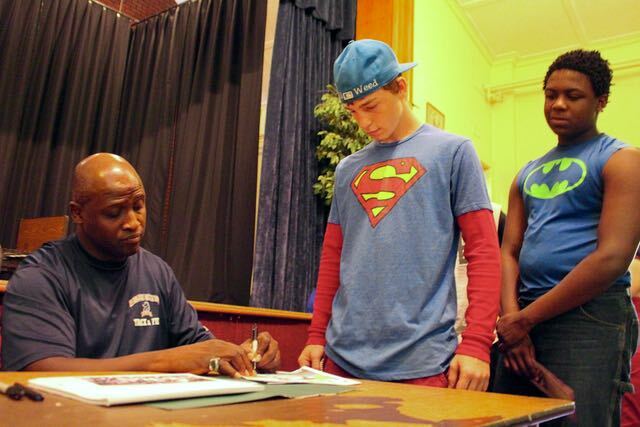 While focusing on his career as a professional athlete, Williams returned to school and earned his master’s degree — an achievement that helped land him a spot as a senior lecturer at Fairleigh Dickinson University in Hackensack, N.J.
Williams said he’s glad he listened to his mentor while playing in the NFL — which he joked stood for Not For Long. While he suffered not a single pulled muscle, or bone break and managed a full decade in the NFL, most players don’t last that long. It all came back to education, which opened opportunities for college and beyond. Now, Williams said, he’s gone from a guy who didn’t like school to someone who teaches at a university. Achieving his career aspirations was made possible through dreaming, Williams said, and that begins at a young age. But don’t dream too long. “The best way to make your dream true (is to) wake up and make your dream a reality,” Williams said. 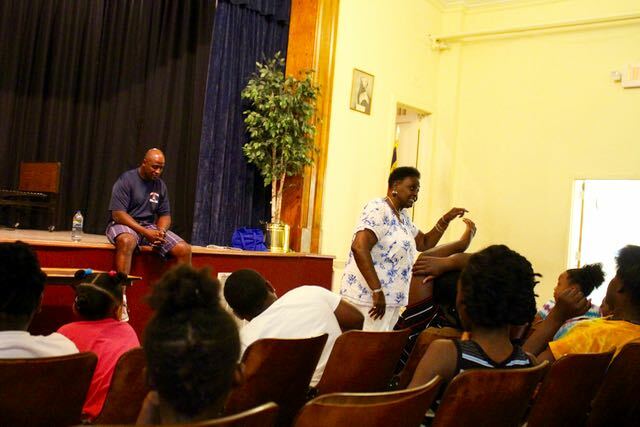 For a time, Hattie Williams, Perry’s mother, took center stage and talked about how to raise a child. Stand firm, she said, and let the child know defined boundaries. Perry clarified which NFL teams he follows and dispelled with the younger members of the audience about who he wasn’t. He roots for the Giants first, he said, but can’t help but cheer for the Seattle Seahawks because of the N.C. State ties. Seahawks head coach Pete Carroll was Williams’ secondary coach while at N.C. State, and Seattle’s rising quarterback Russell Wilson went to N.C. State. Williams is Perry, yes, but not “Refrigerator Perry” of the Chicago Bears. Williams said he was about 300 pounds shy of the former Clemson University star’s weight. Hattie Williams took center stage for a bit after a fan in the audience directed a parenting question at her. No, Williams said, her son did not always listen — but she did her best. And she made sure he received supplemental lessons whenever necessary. She said a friend of his died in a drowning incident, and she recognized the dangers of boys roughhousing in water. She told him to stay away from water, but one day she noticed a soaking-wet pair of shorts in the laundry hamper.